3M 401+ Masking Tape is an industrial tape that delivers super-sharp paint lines at surface temperatures up to 250°F / 121°C. This crepe paper tape is ideal for critical paint masking applications in automotive and industrial markets, which strong holding power and high temperature resistance is necessary. Adhesive formula removes cleanly, leaving no adhesive residue. Remains in place around corners and on irregular surfaces. Thick backing resist bleed through. 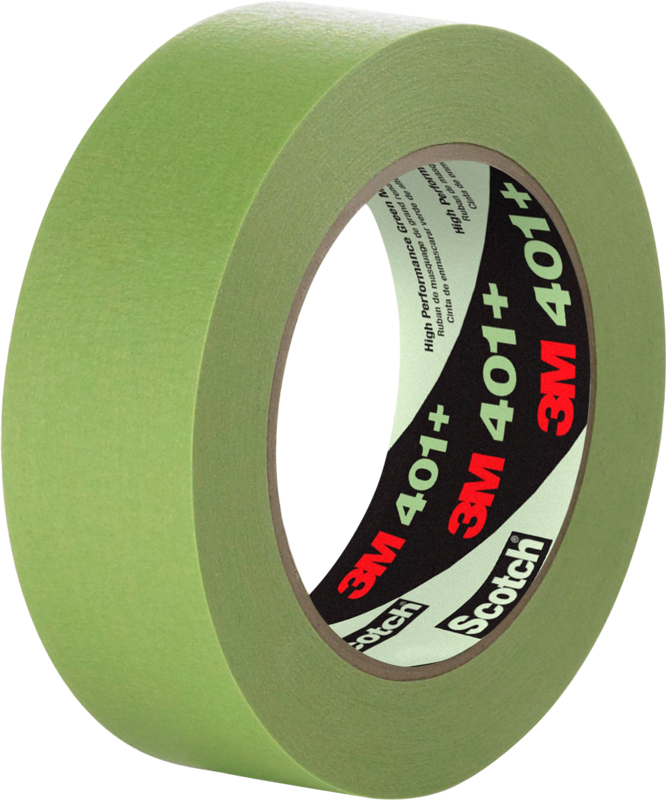 We designed 3M™ High Performance Green Masking Tape 401+ to deliver sharp paint lines where surface temperatures can reach up to 250°F/ 121°C for 30 minutes. This green crepe paper tape is ideal for critical paint masking applications in automotive, specialty vehicle and industrial markets where strong holding and high temp performance is required. Using our proprietary solvent-free adhesive, the tape sticks instantly to most surfaces, including metal, rubber, glass, and plastic, as well as EPDM type rubber moldings while removing cleanly in one piece. Our high-strength crepe-paper backing conforms to irregular surfaces, resists bleed through from most industrial paint systems, improves visibility during the paint masking process, and helps you achieve super-sharp paint lines. 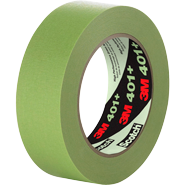 3M™ High Performance Green Masking Tape 401+ is an ideal tape for industrial painting, including two-tone color applications on trucks, buses, trailers, trains, fire trucks, ambulances and airplanes. It is easy to tear, which aids in handling, yet strong enough to resist slivering, providing "user friendly," one piece removal. The tape is conformable for easy masking around corners, over contours and irregular surfaces. Masking tape was developed specifically to help protect surrounding surfaces from overspray, provide clean paint lines, and remove easily and cleanly when finished. Masking tapes from 3M adhere well, resist solvents or water from the paint, and are strong enough to hang plastic sheeting, yet remove cleanly without damaging the subsurface. The backing, typically crepe paper, can conform to curved and irregular surfaces. The tape hand tears for tool-free application. A masking tape should specify what surfaces it will stick to and the interval over which it will remove cleanly. A very thin or poorly manufactured tape may demonstrate splintering or shredding, either coming off the roll or when being removed after use. Some masking tapes have the tensile strength for light commercial and industrial applications, including bundling, labeling, sealing, temporary repairs, lane marking, splicing, and surface protection. The classic crepe paper masking tape is a light tan color, but masking tapes from 3M come in a variety of colors and formulations to meet general and specific applications. A roll of masking tape is a basic toolbox or supply room item in construction, warehousing, military, marine, shipping, and retail industries.